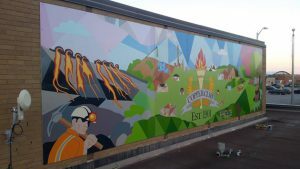 Copper Cliff is celebrating the installation of an addition to its community mural at the community’s branch of the Greater Sudbury Public Library. The art installation is the result of collaborative efforts from community groups and residents of all ages in the Copper Cliff area of the city. With support from the City of Greater Sudbury’s Healthy Community Initiatives Fund, Copper Cliff Community Action Network members and neighbourhood artists Laura-Leigh and Wallace Gillard led the project, promoting local beautification and community spirit. A team of residents met weekly throughout the summer months to share ideas and bring the mural to life. This year’s project added an installation on either side of the existing 12×16-foot mural, which was unveiled in 2017. “We are so pleased to have the opportunity to build on the mural work that began in 2017,” said the Gillards in a news release. The Copper Cliff CAN is a volunteer organization that promotes partnerships, community spirit and works to improve quality of life and space in the neighbourhood throughout the year. The organization leads initiatives such as the Annual Community Yard Sale, Annual Tree Lighting Celebration, ongoing beautification and is also working to bring a splash pad to the community. The CAN works in co-operation with the City of Greater Sudbury and is a collaborative effort of citizens who care about where they live and want to make their neighbourhood the best it can possibly be. “Copper Cliff is very fortunate to have two talented artists in our neighbourhood with vision and dedication to making Copper Cliff the best it can be,” said Margaret Julian, Chair, Copper Cliff CAN. artists Laura-Leigh and Wallace Gillard led the projectCopper Cliffmuralpromoting local beautification and community spirit.